I think we will all agree that the best thing about eating Indian food is the naan bread, right? I absolutely love garlic naan bread on its own or dip into my low carb tikka masala curry sauce. 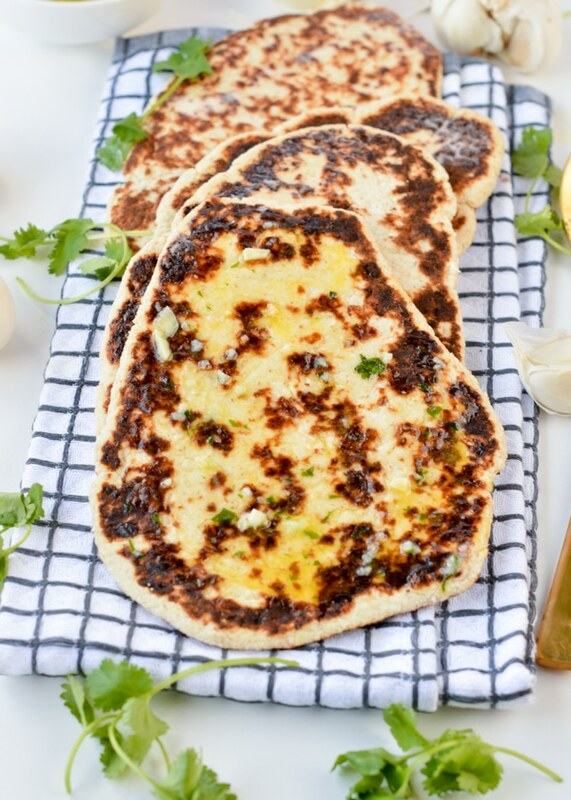 If you just started a low carb diet, you may miss this delicious Indian side bread so here is my recipe ! 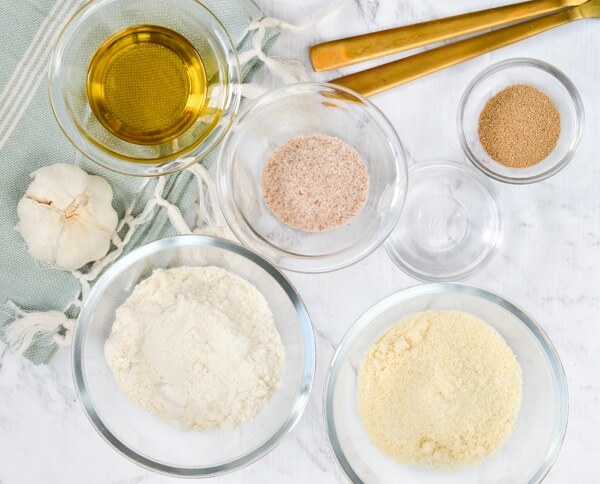 Weigh the ingredients – low carb baking use high fiber flour, for full precision it is better to measure the flours in grams. Cups works but are not as precise. A bit too much of one flour will get your dough dry, difficult to roll out without breaking. Parchment paper – low carb dough are stickier and it must be rolled between pieces of parchment paper. This avoid the dough to break or stick to the roller pin. Patience – low carb flours contains lots of fiber it means they are highly water/liquid absorbent. But the fiber needs time to absorb the water, that is why it is important to knead the dough for at least 2 minutes to help the fibers be in contact with the water and make their job. Same with resting time, this ensure full fiber activation. What to eat with naan bread? 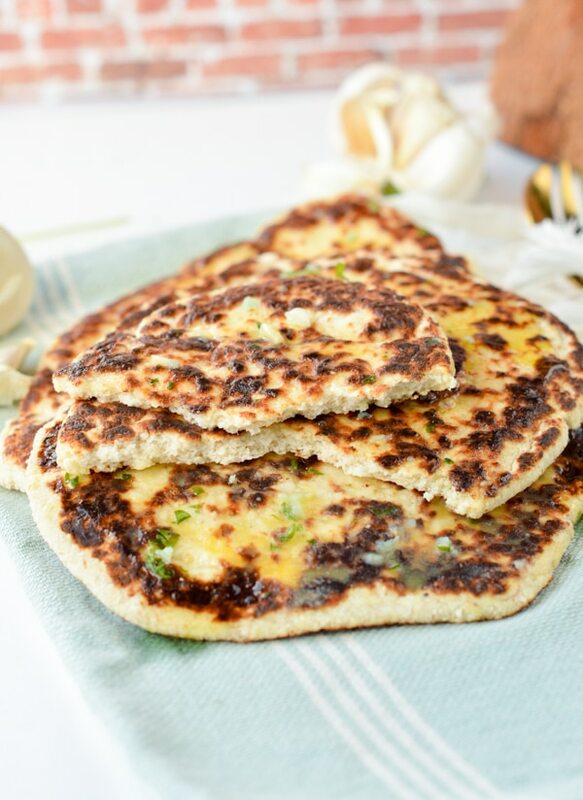 I love to eat my low carb naan bread with garlic butter on top as a side to Indian curry or low carb soup or as a sandwich base to roll some food. If you are vegan you can make garlic butter using dairy-free margarine or olive oil. 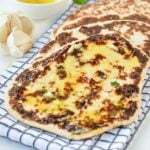 WATCH THE LOW CARB NAAN BREAD RECIPE AND MAKE SOME NOW ! I hope you enjoy this new low carb baking recipe. If so, share a pic with me on Instagram before you dig in! I love to see your creations. Place lukewarm water in a measuring jug. Stir in dry yeast. Set aside 5 minutes to activate the yeast. In a large mixing bowl, combine all the dry ingredients : coconut flour, psyllium husk, almond flour and salt. Pour in yeast mixture and olive oil. Use a spatula to combine at first, then knead the dough energetically with your hands for 2 minutes - not less!. The texture is very wet at first, drying out as you go. Knead for at least 2 minutes to make sure that the fiber from the husk and coconut flour absorb all the moisture. Form a ball of dough. Set aside for 10 minutes in the mixing bowl at room temperature. After 10 minutes, knead the dough again for 30 seconds, shape a ball and split the dough in 4 pieces. Shape 4 balls. This recipe makes 4 large naan bread, you can also shape 6 small naan bread by dividing the dough into 6 balls if preferred. Prepare two pieces of parchment paper. Place one on the bench top, place the dough ball in the middle of the parchment paper sheet and cover the ball with the second piece of parchment paper. Press the ball slightly to stick the paper to the ball. 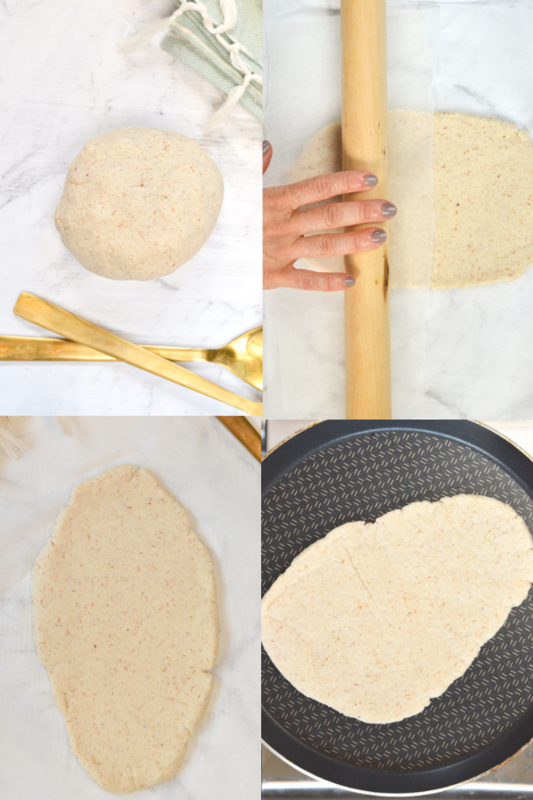 Use a rolling pin to roll the dough into a naan shape. Keep the dough slightly thick to mimic real naan bread. Remove top parchment paper layer. Reshape the sides of the naan bread with your fingers if needed for lovely smooth sides. Warm a non-stick crepe pan or pancake griddle under medium-high heat. 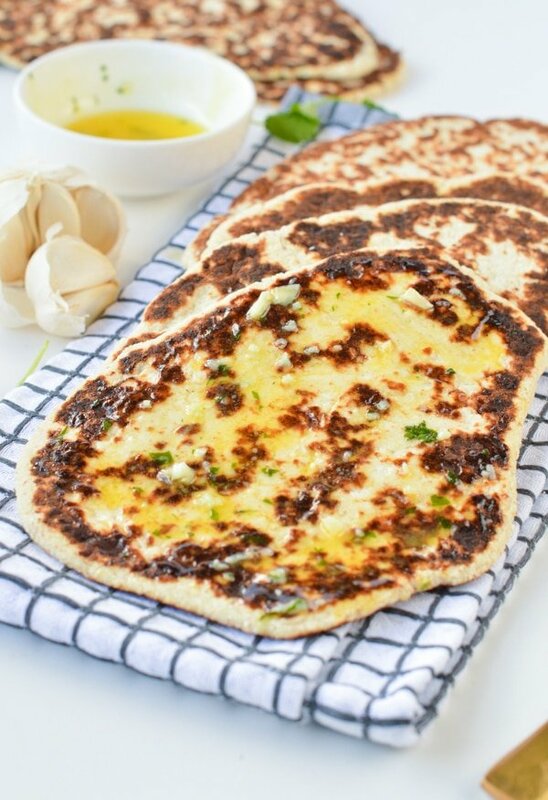 When the pan is hot, flip over the rolled naan onto the pan, peel off parchment paper carefully and cook the naan bread for 1-2 minutes on high heat until black spots appears. Slide a large spatula under the bread to flip over and cook for 1 minute on that side or until brown/black spots forms. Those naan bread are large and heavy so a large spatula is a must to flip them over without breaking. Shape smaller naan bread if you don't have a large spatula. Serve immediately, spread 1/2 teaspoon of olive oil or melted butter on top of each bread, crushed garlic and chopped coriander if desired. Repeat the rolling and cooking process for the following naan bread until no more dough left. You can store the cooked naan bread for 2 days in the pantry, on a plate. Cover the plan with a clean kitchen towel to keep them soft and moist. Rewarm in a non-stick pan for 1 minute on both sides before serving. You can freeze the cooked naan bread. Freeze wrapped individually in plastic wrap. Defrost at least 3 hours before, make sure you remove the plastic wrap when out of the freezer to avoid extra moisture to goes into the naan breads when they defrost. Rewarm in a hot non-stick pan on both sides for about for 1 minute. Non-stick pan: you don't need to grease the pan if you are using a non-stick tefal crepe pan as I am using in this recipe. If your pan tend to stick, make sure ou rub the surface with some oil and a piece of absorbent paper. Too much oil will fry the naan bread, that is no what you want. your dough is sticky or too moist add a bit more psyllium husk, 1 teaspoon, knead and see how it goes. your dough is too dry, add more water, 1 tablespoon, knead and repeat if needed. Do you have to use coconut flour in this? I hate how that makes things taste. Yes definitely ! sorry you don’t appreciate the flavor of coconut flour. 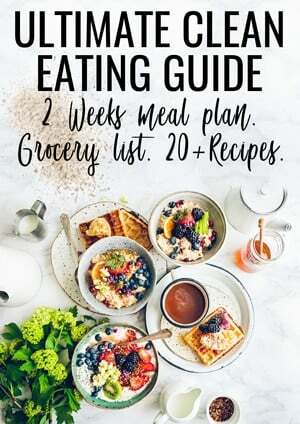 Enjoy the coconut flour-free recipes on the blog, there is plenty ! XOXO Carine.